Fiction – paperback; Vintage; 466 pages; 2010. Stuart Neville’s debut crime novel is set in Belfast at a fragile time in the peace process. Gerry Fegan, a former IRA hitman who murdered 12 people during The Troubles, is haunted by the ghosts of his victims. These comprise five soldiers (three Brits and two from the Ulster Defence Regiment), a cop, two Loyalists from the Ulster Freedom Fighters, and four civilians “who had been in the wrong place at the wrong time”. Fegan is particularly haunted by the deaths of a young mother and her baby whom he “accidentally” killed when the bomb he planted in a butcher’s shop went off earlier than expected. He continues to hear the cries of the baby, which he tries to drown out by drinking himself into a stupor every night. The other ghosts follow him around and talk to him. Sometimes he talks back. So far, so good. This looks like a book about remorse and guilt and atoning for your sins. But no. Neville takes it one step further and turns it into a form of vengeance, because the only way Fegan can come to term with his past deeds is not to accept personal responsibility for them, but to find the people he blames for making him carry out these horrendous acts. And then kill them. One by one. His hitlist includes a past member of the IRA who has reinvented himself as a leading politician in Stormont; a former soldier of the Black Watch Royal Highland Regiment; a handful of Belfast street thugs; and a priest. 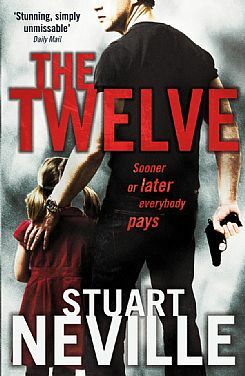 If The Twelve is to have any redeeming features it is that it quite clearly shows how murder and corruption is rife on both sides of the political and religious divide. Neville also exposes the hypocrisy at the heart of the peace process, which does not seem to be motivated by peace and goodwill, but by who can get the larger slice of the political and financial pie. While Fegan is running around the streets trying to pick off the people he feels destroyed his life and, in turn, the lives of 12 others, he bemoans the fact that the younger generation are more concerned about having the right car and living in a nice house than anything that went on before. The Troubles, he realises, mean nothing to the young adults of today. But Campbell, a soldier who once patrolled the streets of Belfast and now resides in the Republic, thinks the changes are fairly superficial. The city’s invisible borders remained the same as when Campbell first walked its streets holding a rifle eighteen years ago. The same lowlifes still fed off the misery they created, deepening the divisions wherever they could. The same hatreds still bubbled under the surface. But the city had grown fat, learning to mask its scars when necessary and show them when advantageous. Despite these perceptive insights into life after The Troubles, I felt slightly ambivalent about this book. Once you strip the setting away, this is a fairly laborious read about an old hitman now conducting a new series of assassinations. The story is completely devoid of heroes, as well it might be, but for a thriller to work you clearly need to be cheering on the protagonist. I felt nothing but ambivalence towards Fegan. I also struggled to get beyond the cliches: the woman who needs saving and the tough nut who begins to open up to her. I won’t mention the guns, the car chases, the beatings and the deserted rural properties where everything comes to a head! I surprised you even picked this one up…. Looking forward to your thoughts on Joyce’s “Dubliners”, one of my favorites, which I’ve read multiple times. I picked this one up on the basis I had heard a lot of good things about it. Plus, I heard the author speak at the Harvill Secker day at Foyles earlier in the year and thought he was an interesting chap. Still reading Dubliners and enjoying it, but saving up the last story, which Im told is the best one in this collection. I didn’t enjoy this one all that much either. I thought it had a nice style at the start, but as you say it degenerated – the final chapters were too much protracted violence and the ending a cop-out. I should not have been so nice about it in my review, I find it very hard to give a bad review to a book. Call it a weakness. If this were a film I can imagine the type of film it would be. Well, the good thing about two-star reviews is the money you say as you won´t rush off to put it on your list. Too bad about this–it sounded promising and I even have it checked out from the library, but I ended up reading Tana French this weekend instead. Unfortunately it was the only book from your N.Ireland list I could find here. Not that I want you to have bad reading experiences but it is nice to kow I am not alone in having less than glowing feelings about this book (released here as THE GHOSTS OF BELFAST). I thought it ultimately dull, unnecessarily violent and bordering on the mysoginistic.